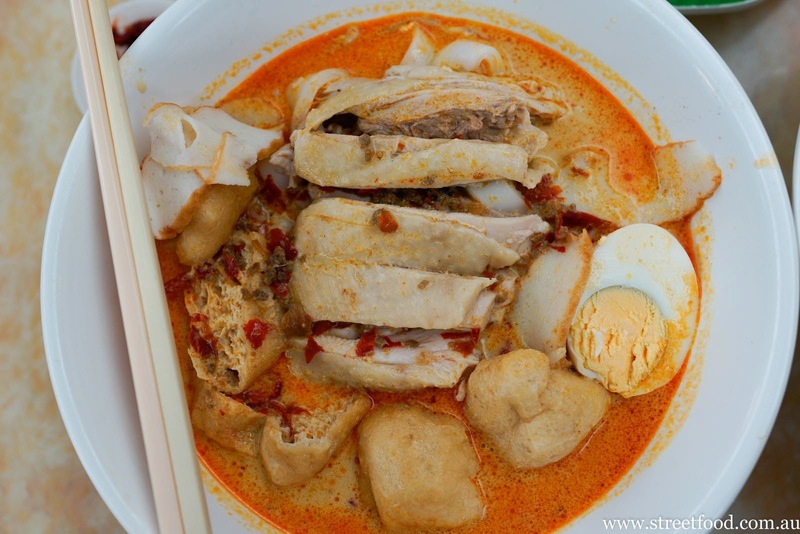 When it comes to Singapore and Malaysian food we find ourselves ordering the same dishes over and over again. To break old habits we clock the menu at Singapore Shiok, eating every dish on the menu over a few months. It's a fairly small menu so it's doable. After trying everything the chicken rice and the har mee are still our favourites, closely followed by the nasi lemak and the char kway teow. But a new obession emerged from the exercise: hor fun. 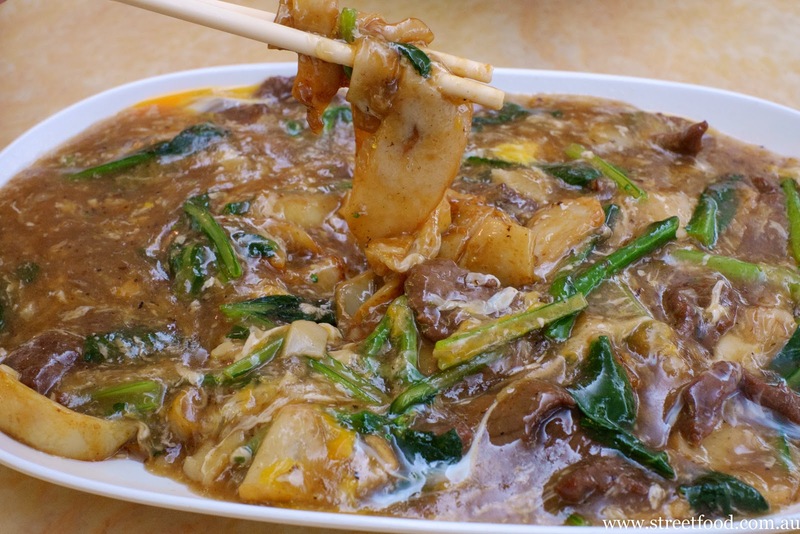 Love those smoky wok fried flat rice noodles covered in gooey gravy, comfort food plus. Singapore Shiok has long been our favourite food court stall in Chinatown. When it first opened it was about the only place you could get a good chicken rice or har mee in this neck of the woods. 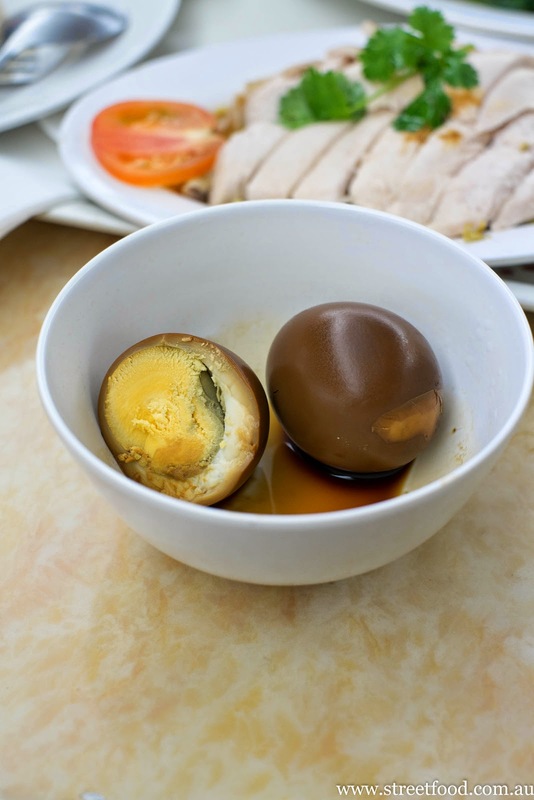 These days there's plenty more options around but Singapore Shiok is still our favourite, for reasons of nostalgia as much as any. 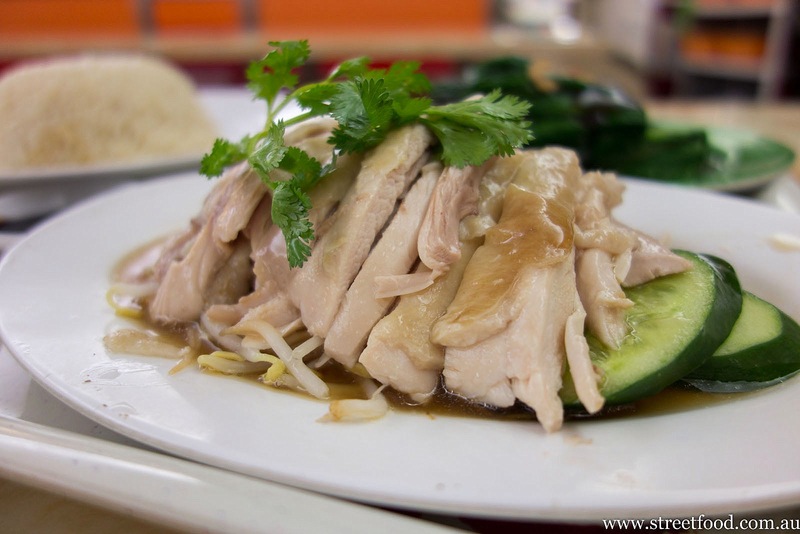 Mr Shawn's all time favourite feed in Chinatown is Singapore Shiok's Hainanese chicken rice set. 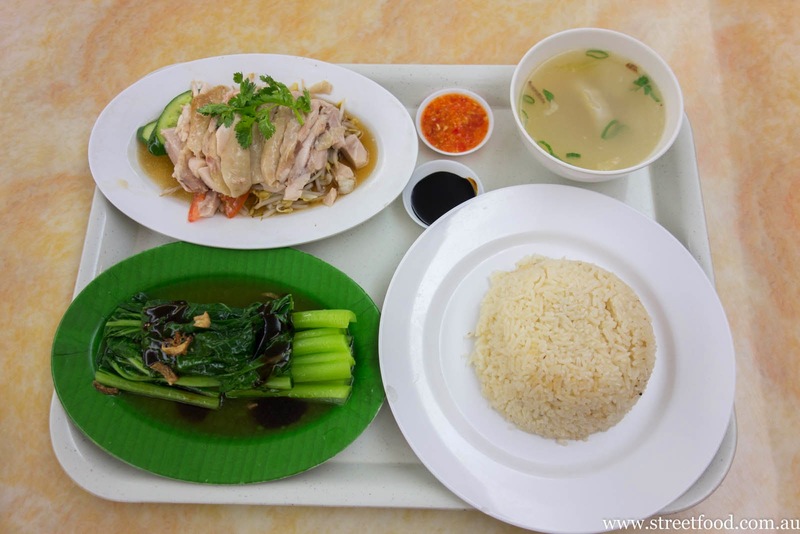 You get the all time classic dish of poached chicken with chicken flavoured rice, the authentically crappy side soup plus the added goodness of Chinese veggies in oyster sauce. $10.00 if you get it at lunchtime, a couple of bucks more at night. Watch out when you sup that soup broth, it can be scalding hot. The chicken varies in yumminess from day to day, ask for a thigh piece for maximum moistness. 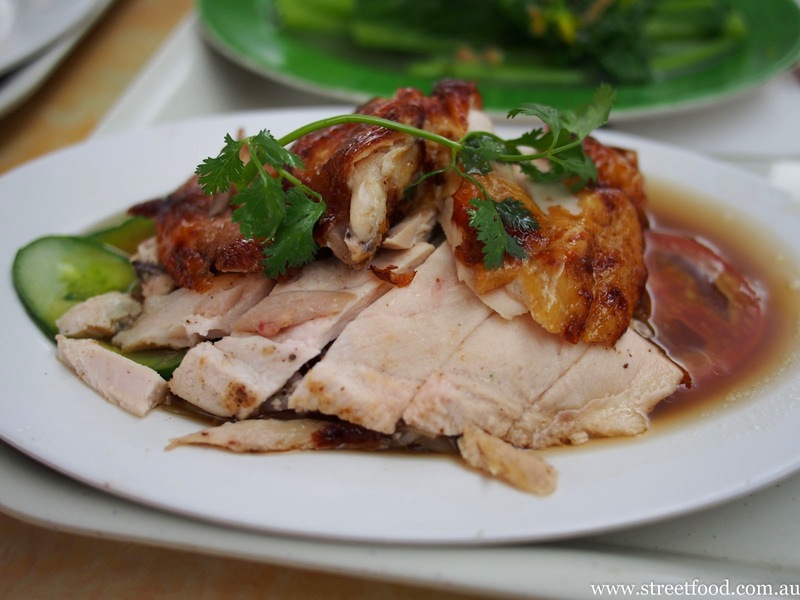 If you're Hainanese chicken rice agnostic then you might want to try the roast chicken version instead. 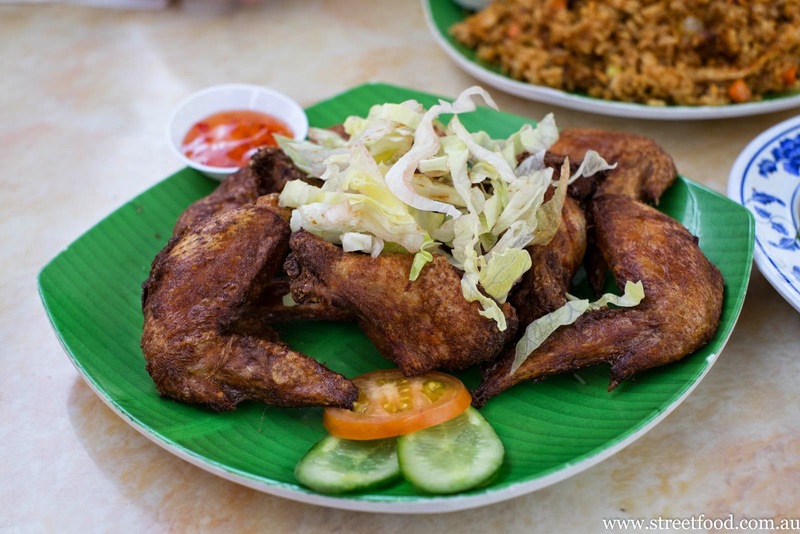 It has stronger chooky flavours than the regular Hainanese chicken rice and is easier to recommend, especially with that lovely nice star anise flavour to the crisp skin. 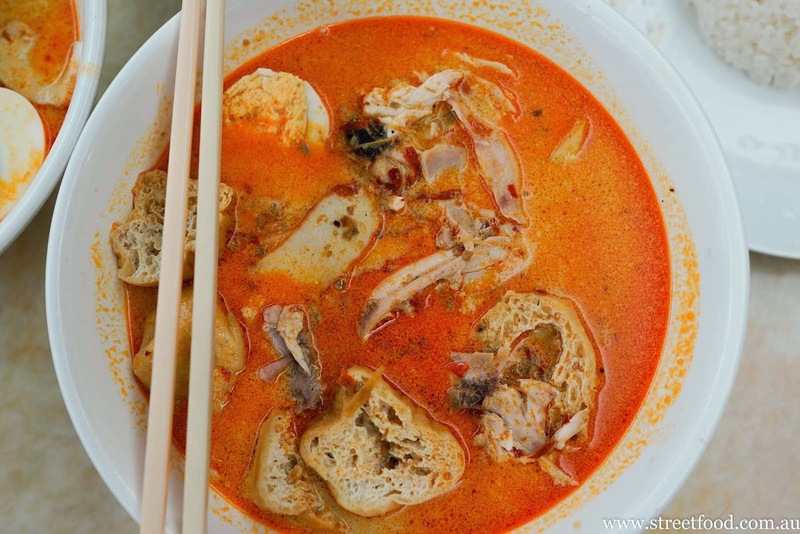 The Hainan chicken laksa ($9.90) - is a spicy, creamy, coconut-y laksa with slices of steamed chook on top. Our favourite part are the sauce soaking tofu puffs, a pleasure similar to sucking coffee through Tim Tams. Sambal kangkon - $8.50. 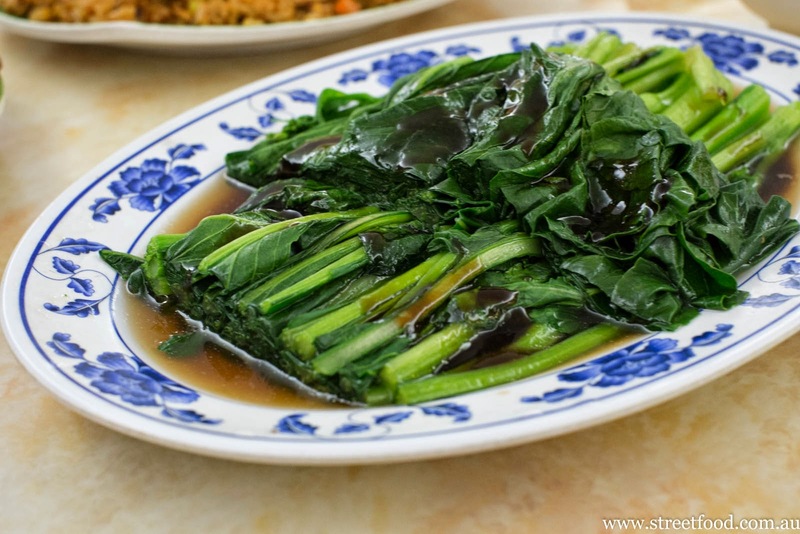 Water spinach in a spicy, prawny sauce. Awesome. It's a large serve, and half the price you would pay in a restaurant. Super happy. We happily eat this one night with just some rice, it's a green veg vitamin shot. Mee goreng - $9 something. Yellow noodles stir fried with chicken, tofu, tomato, Chinese greens and onion with a fried googie on top. The sauce is quite sweet, probably from kecap manis. Sambal sotong - $9.90. 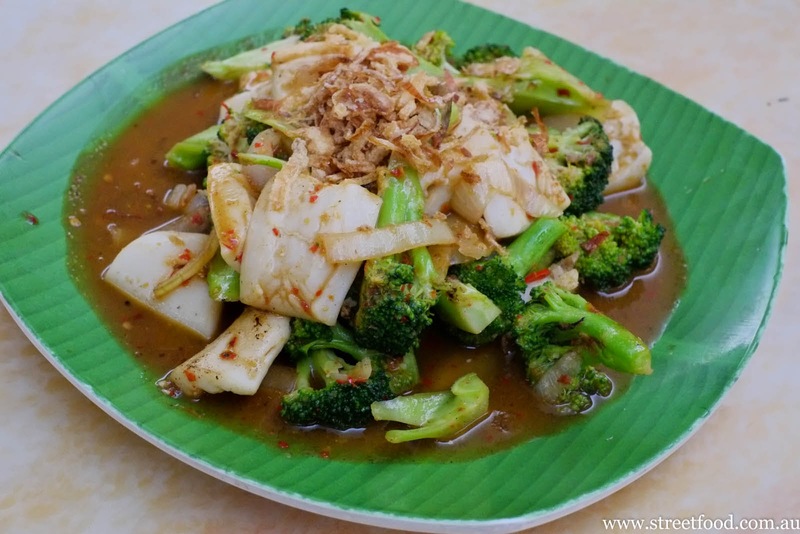 Stir fried squid tubes with broccoli in chili\shrimp paste sauce. Not super spicy and we miss not getting any of the squiggly leg bits. 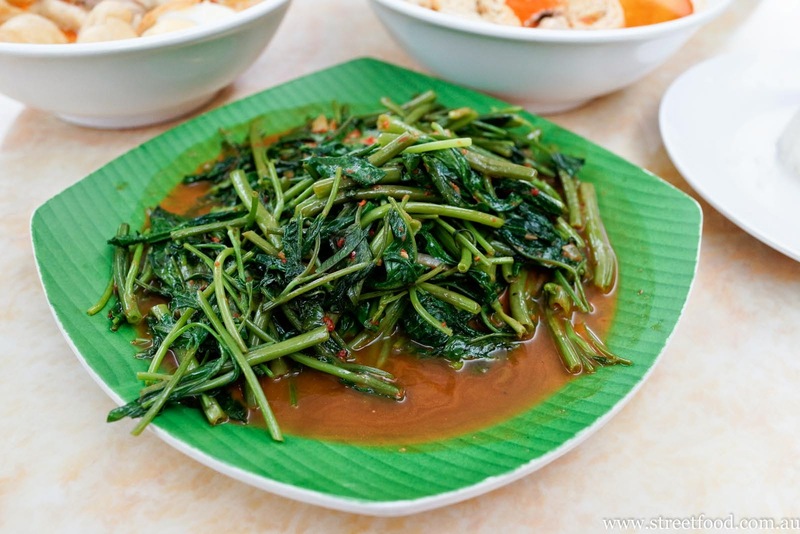 It's an OK dish but not a 'wow' number like the sambal kangkong, which we love to bits. Having said that, with the fresh greens this dish partners up nicely with something more stodgey, like char kway teow. Sambal prawns- $9.90. Like the sambal sotong this dish is better in theory than flavour, though if you like your food not-so-spicy you may dig this. Char kway teow - $8.50 (chicken). 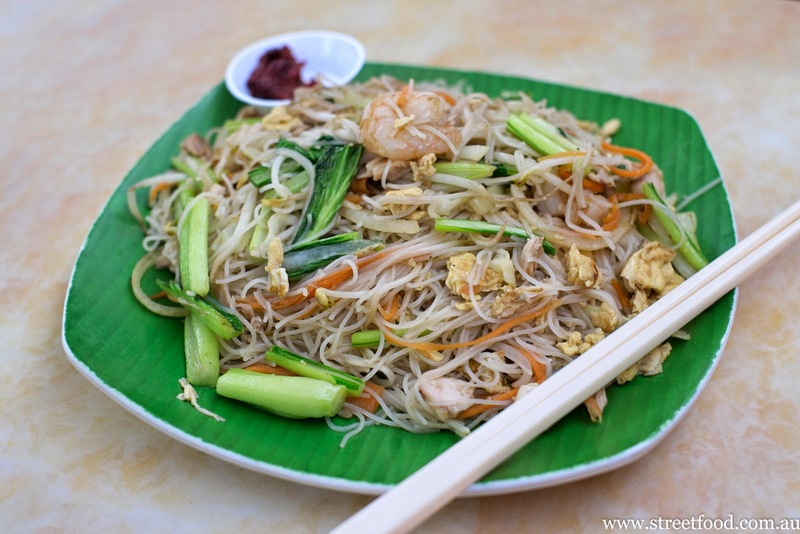 The classic dish of fried flat noodles with chicken (or seafood), with a sprinkling of veggies and oodles of calories. The Mr Shawn is usually not so excited about char kway teow, but the tiny crunchy porky bits and the subtle seasoning, which we later figure is probably a dollop of ketchup, give this a real lift. Chicken wings - $2 for two pieces or $8 for four. Crispy skinned fried chicken for naughty boys and girls. Recommended. 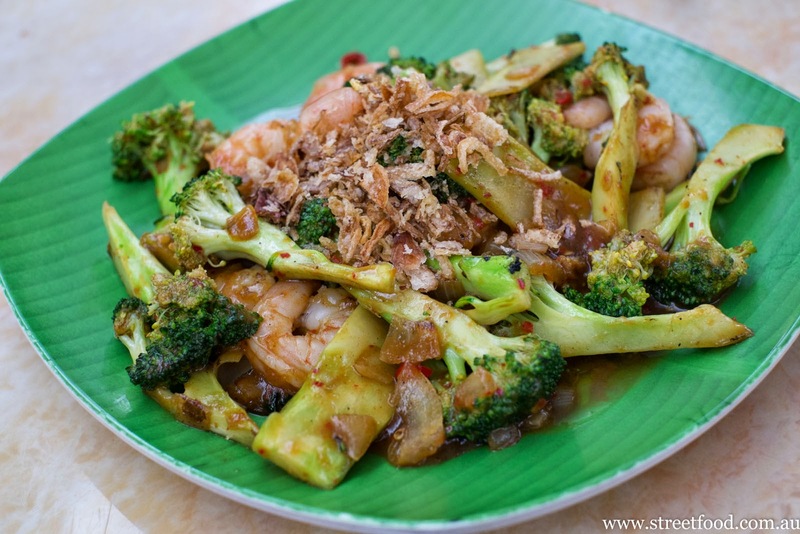 Veggies in oyster sauce - about $8. Eight bucks may be a bit pricey for this dish in a food court, but it's excellent. Har mee - prawn noodle soup - 11.50. Miss Chicken's favourite - a dark punchy broth made from prawn stock, with two types of noodles, a couple of prawns and pork slices, a googie, and a few sinfully delicious bits of crispy pork lard. Hor fun - about $10. 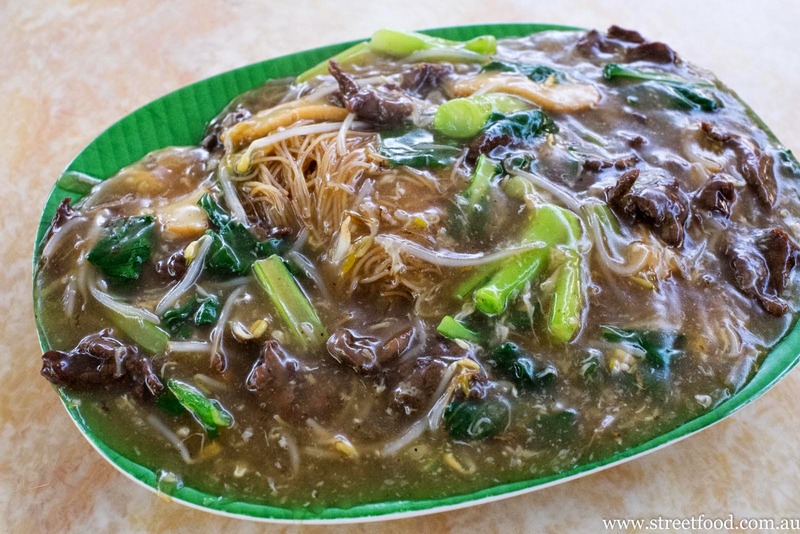 Stir fried flat koay teow noodles with smoky breath-of-the-wok flavours smothered in a thick gravy with beef (or chicken, seafood, etc) and some greens. The gravy magically transforms in texture as you eat it: from thick to thin, from gloop to soup. The flat noodles are submerged in a sea of delicious goop. 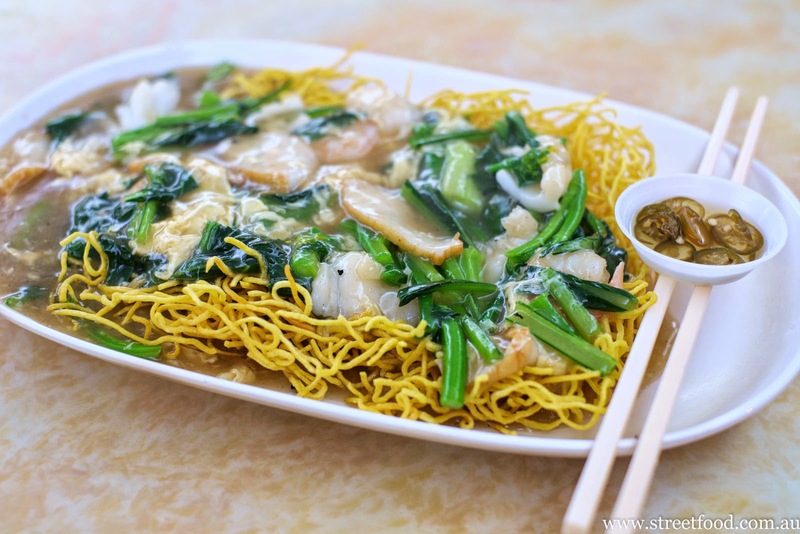 Crispy noodle in gravy with seafood - $10.90. The goop fest continues. Love the texture of the light crunchy noodles against plain gloopy gravy with seafood (or chicken or beef etc). There's a bit of garlic in there and an egg whisps to give the gravy more oomph. A plain dish that's wonderful when you're in the mood for it. 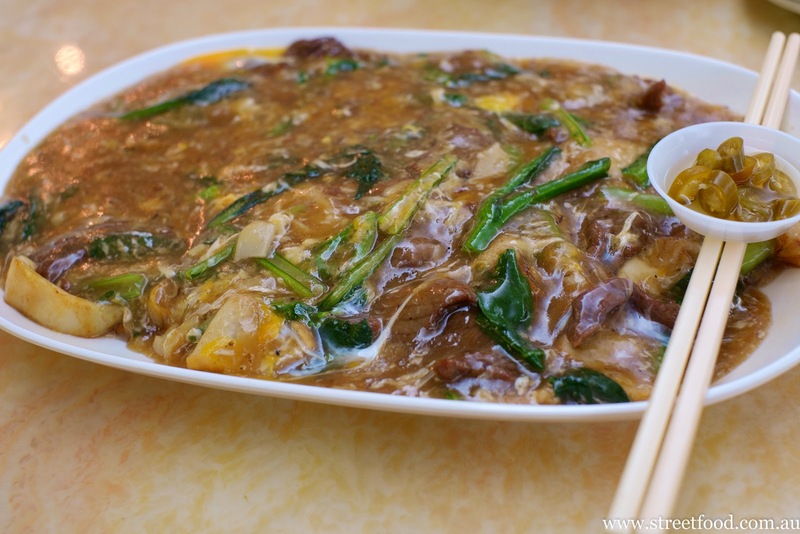 Vermicilli in gravy - about $10.90. Another goopy great. This time it's thin noodles in goop - like Singapore Noodles under the sea. Nasi lemak - $7 (lunch special). 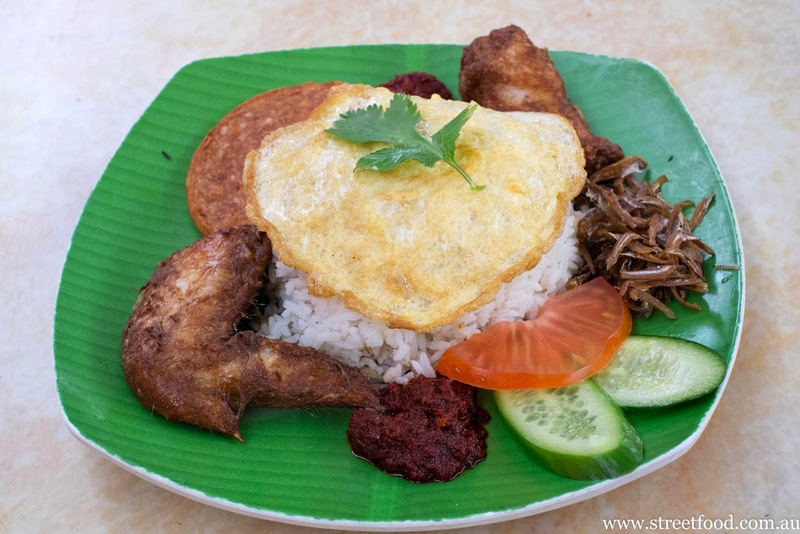 We love every restaurant has a different interpretation of nasi lemak, we love every one of them. Singapore Shiok gives a nice coconut punch to the rice yet it's still nice and light. For protein we have a couple of small pieces of crispy deep fried chicken, a semicircle of fried Spam-like meat product which is far tastier than we are prepared to admit, the egg is fried like a thin omelette, and the crunchy anchovies are naked on the side. Yum! Curry puff - $1.50. 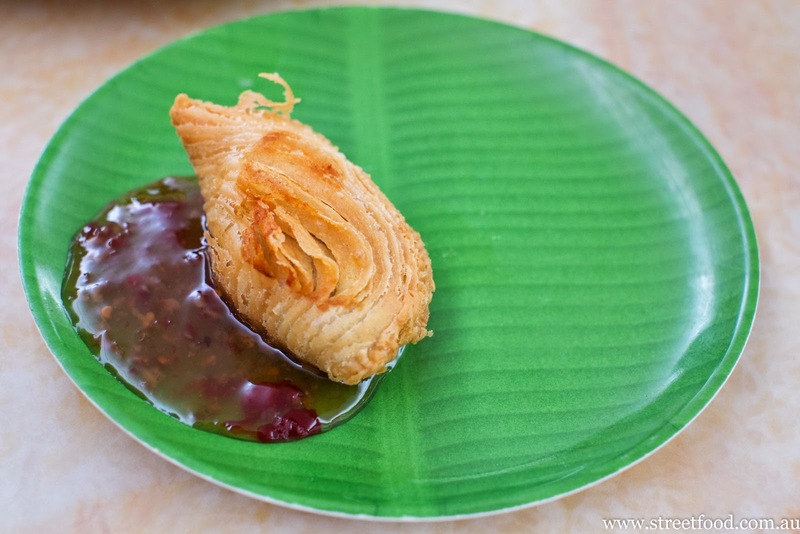 A sweet pastry with a mild filling, made with a pretty flourish. Hokkein noodle - $9.90. Thick yellow noodles and thin rice noodles stir fried with pork and seafood. 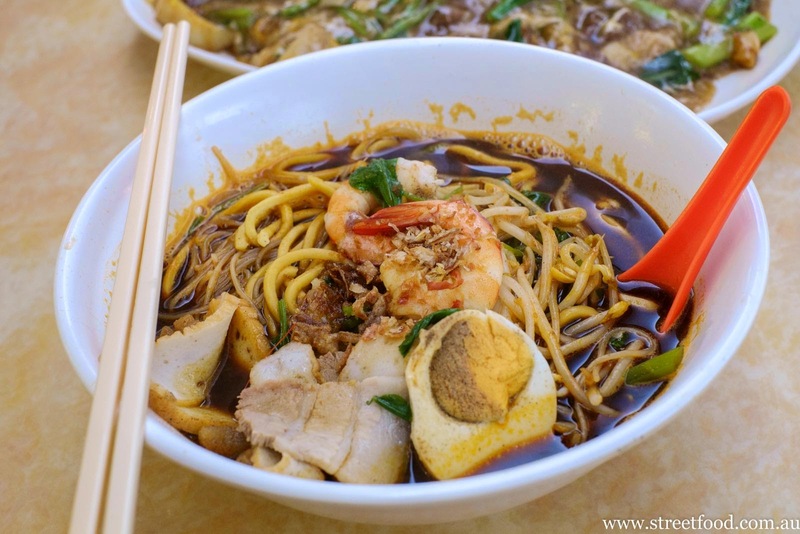 We were expecting the noodles to be dark with soy sauce and swimming in a sea super prawnie sauce like in some of the Hokkein mee dishes we have tried, including Singapore Shiok. We liked what we got however: a nice clean fresh tasting dish, simply seasoned with a little stock (we think) and a dollop of that delicious sambal on the side. Shiok fried rice - $9.30. 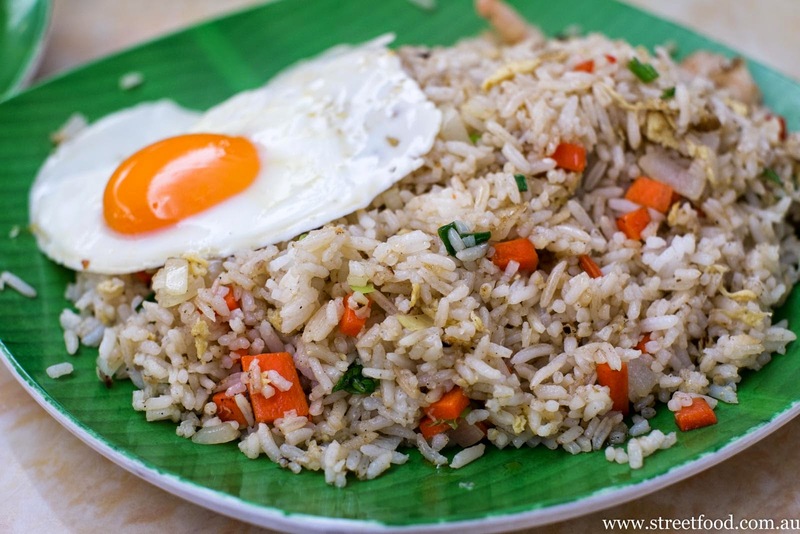 A good simple fried rice made even better when we bust open the runny egg yolk. Sometimes there's nothing better than fried rice. 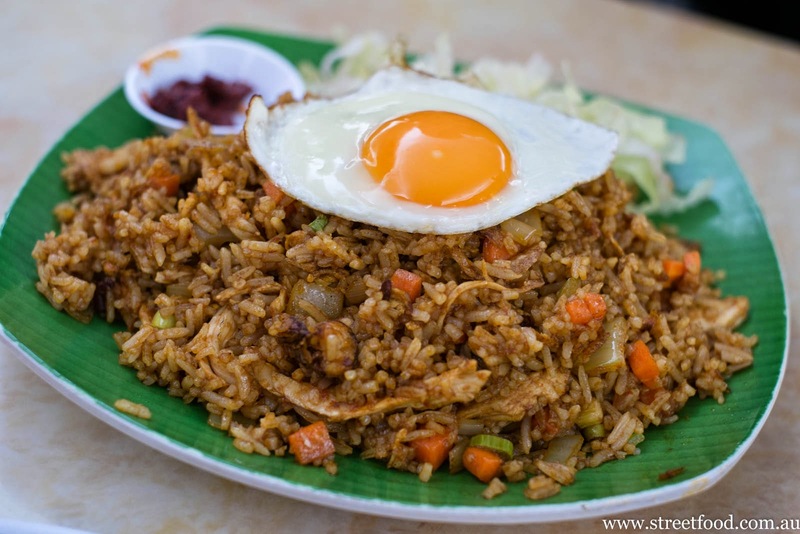 Nasi goreng - about $9. Fried rice spice up with (we guess) some belecan (shrimp paste) and we reckon maybe a dollop of ketchup. Bewdy. We must say the egg looked rather beautiful, prettier than the picture. We recommend adding some of their most excellent sambal. 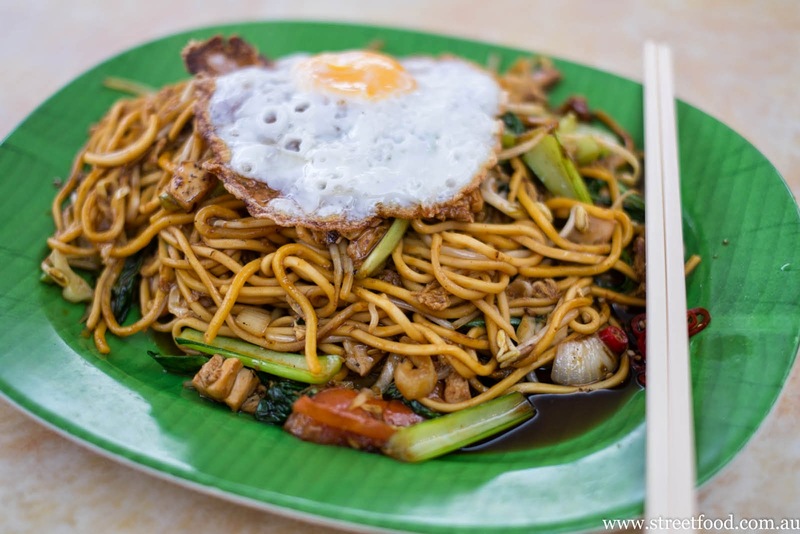 Singapore fried noodles - $9.30. Stir fried thin noodles with chicken, egg, greens and a bonus prawn because you're so good looking. It's like Aussie Singapore noodles only with a bit more street cred. 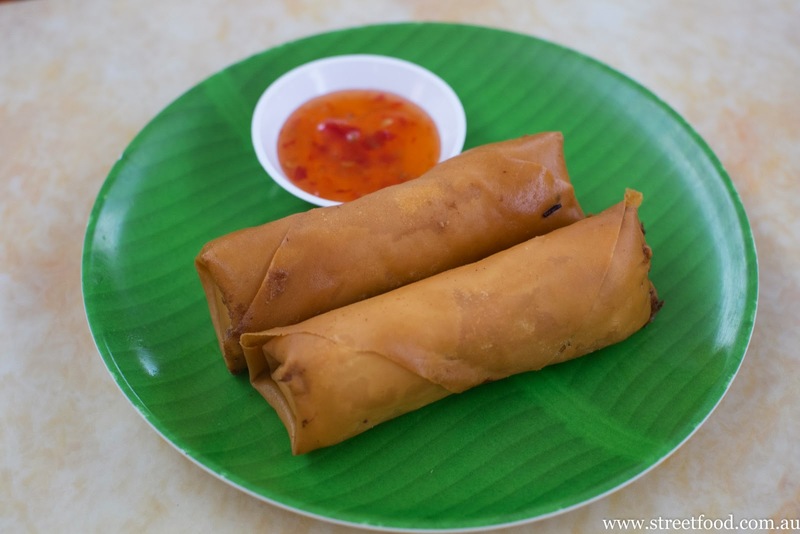 Vegetable spring rolls - about $1 each. Clocking the Shiok made us order spring rolls which we never do, and they're great. Soy egg - $1. A boiled googie marinated in soy, star anise and whatever makes it the universally delicious street snack of Asia. 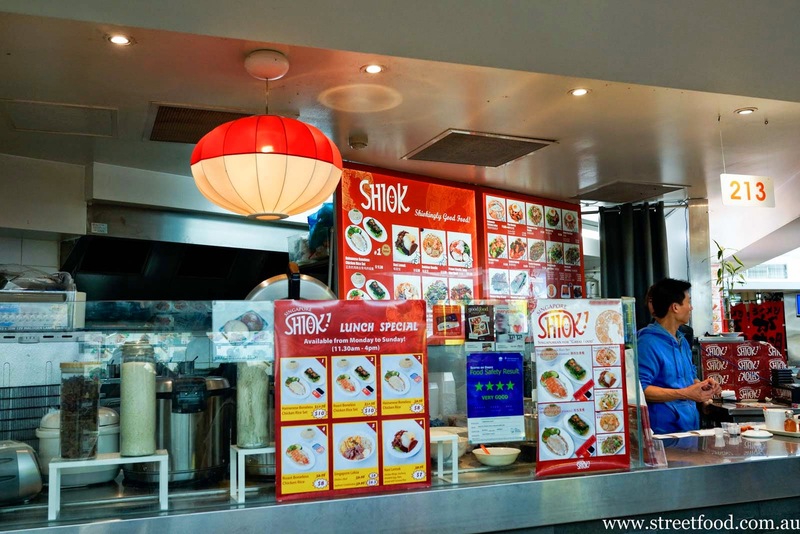 Singapore Shiok is in the Eating World food court, top of the Dixon Street Mall, Chinatown. Haha you guys have been at Shiok for years now! I swear I've seen the business for sale on gumtree at various points over the past 6 months- I even asked them about it on their facebook page (which is now down) - maybe they've changed owners once again. It's been long run by Indonesian chinese rather than Singaporean Chinese, but that hasn't seemed to affect the authenticity of the dishes. 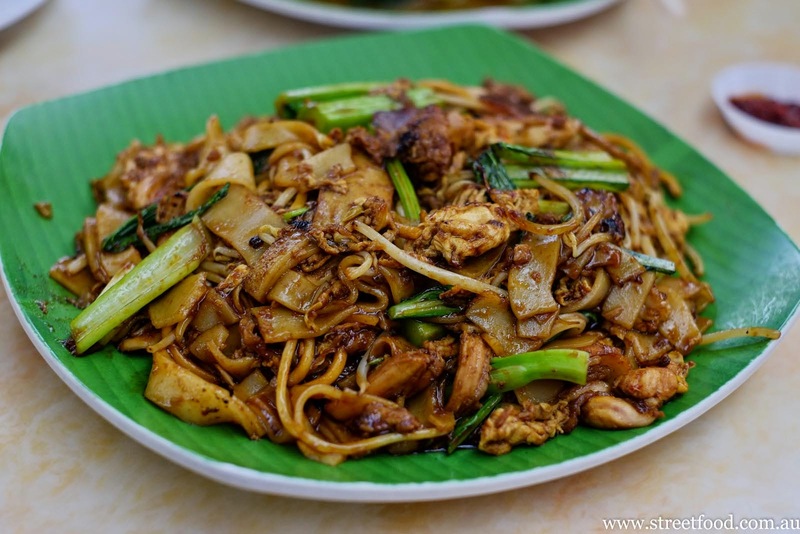 The taste of the Char Kway Teow comes from a mixture of fish sauce and a sweet black sauce aptly known in singapore (in mandarin/hokkien) as "sweet sauce" - it's quite different to the Indonesian kecap manis. Singapore is probably the only country in the world to sell this - I've never found it in any store here, across most of malaysia or china. 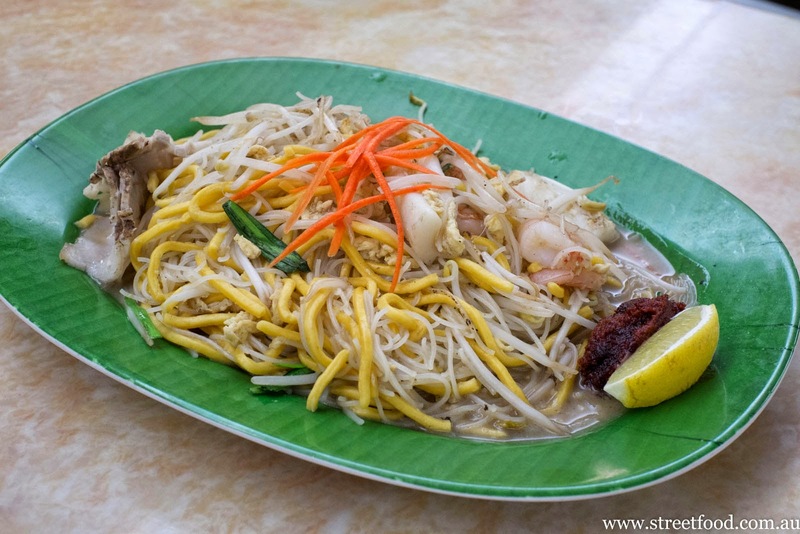 Not sure if it's still the case, but the singapore fried noodles used to be translated on their menu as 炒米粉, more commonly known across Southeast Asia as Fried/Char Beehoon (or bihun/bihon, as Indonesians and Filipinos respectively call it). The last time I had their rendition of the dish, it carried a wonderful garlicky aroma- is this still the case? Singapore Shiok no longer at Eating World!!! Aaargh! Where has it gone? I love their chicken rice! Must go back to try more of their menu as well. I love your blog and check it daily for new street food eats around Sydney, which I'm constantly making note of. Keep up the amazing work!! So sad this has closed! "Chicken wings - $2 for two pieces or $8 for four." - This doesn't make sense. Wow that is a really comprehensive clocking you guys have managed to complete. I think I like the crispy noodle the best. Just by thinking of how the crispy noodle will magically turn soft upon touching the gravy is simply mouthwatering. Here in Adelaide I don't think I can buy it from any store. I would have to find the recipe online and whip up something similar hopefully.